This tutorial is meant to show how GoLive users can integrate their PHP/MySql dynamic data with PayPal to create a simple online store with some advanced pricing features. This tutorial assumes that you are already familiar with using dynamic content in GoLive and aren't too terrified with working with source code. You will also need a PayPal account. Rather than reinvent the wheel we'll start out with an existing database and table. I've already defined my data source within my site settings and added a new page to my site. Make the Page Dynamic Before we can add our content source object we need to make the page dynamic. Since this is a PHP tutorial we're gonna go with PHP. Add a Content Source Next we need to add a content source. 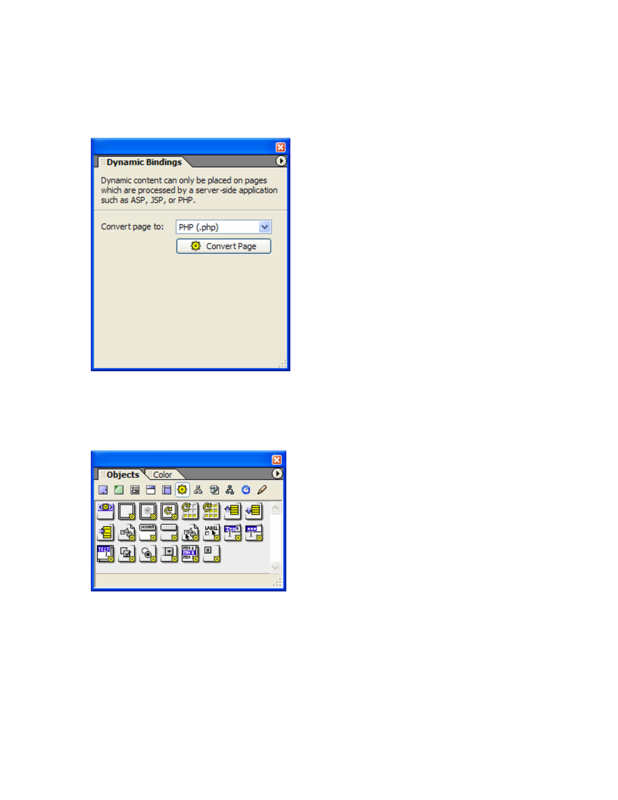 From the dynamic content palette select the content source object and drag it to the page. The content source object will show up in the heading. Double-click to activate it in the inspector. Fill in the appropriate information for your content source. When you setup a content source its always a good idea to test your source. When you click test source you should see the first record matching the criteria in your content source settings. Ok at this point we have a dynamic page (PHP) and a content source for the page. I've added a banner and some text to the page. Next we need to go to the PayPal site and create an add to shopping cart item. Do this by signing onto PayPal with the account you should have already setup. From your "My Account" page select the "Sell" tab. From the sell page you want to select PayPal Shopping Cart. We are going to create a single add to shopping cart item. 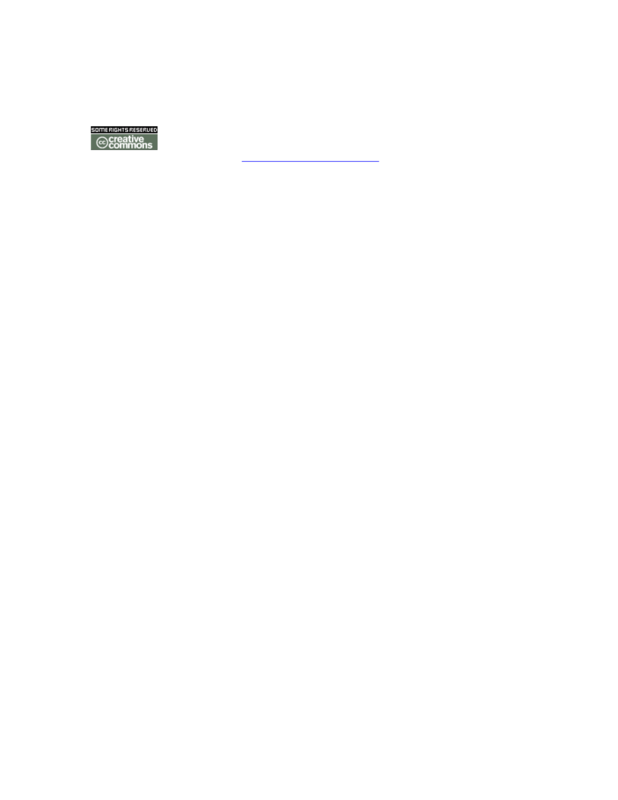 This item is going to be the template for our page. I've entered Item for the name and a price of 200.00. I'm going to use the default Add to Cart button. Click Create Button Now (not shown). 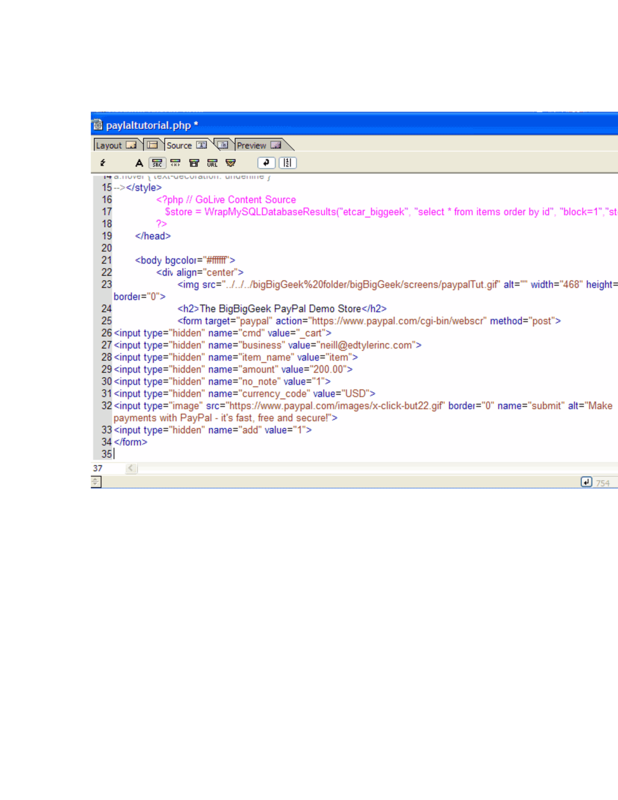 This generates the PayPal code that we are going to paste into our site. 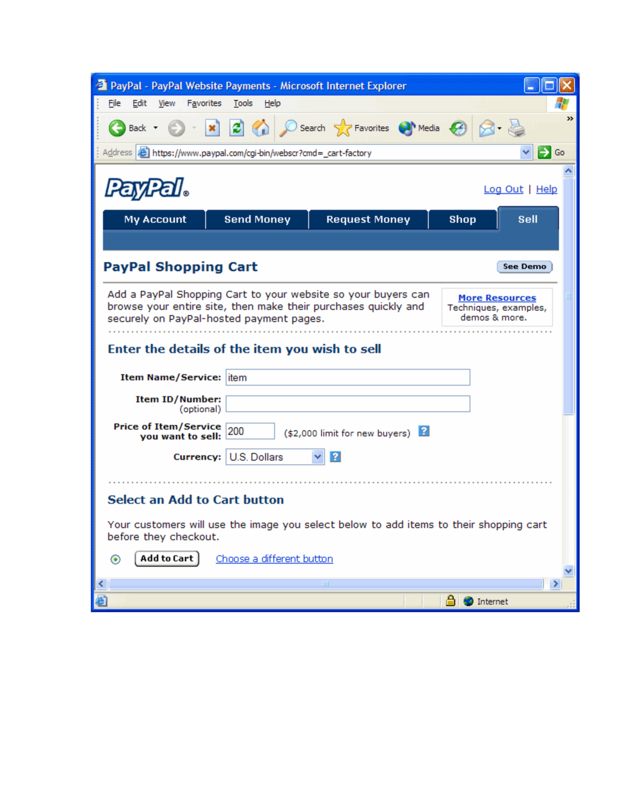 First we are going to select the add to cart text generated by PayPal and copy it. change to the source view. 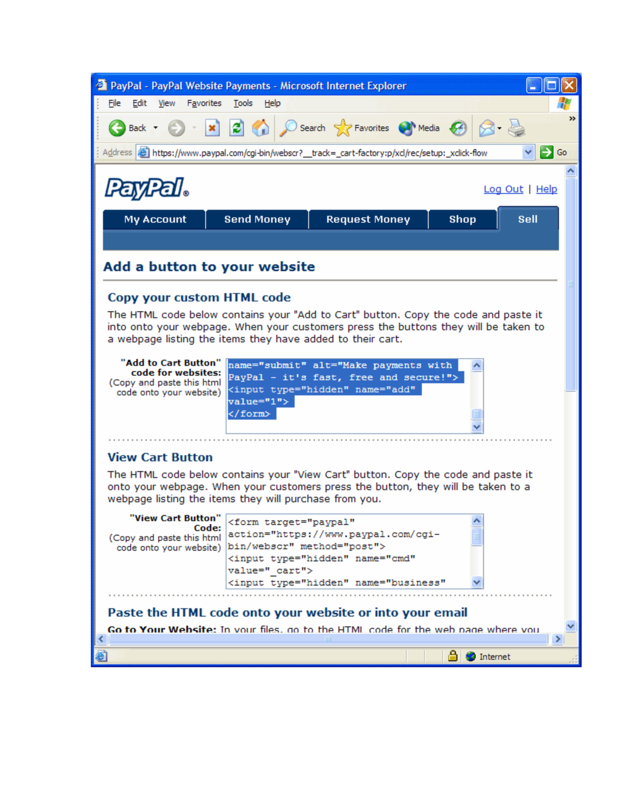 Make sure that the insertion point is where you want it, then past the copied PayPal code. Switch back to layout view and take a look. 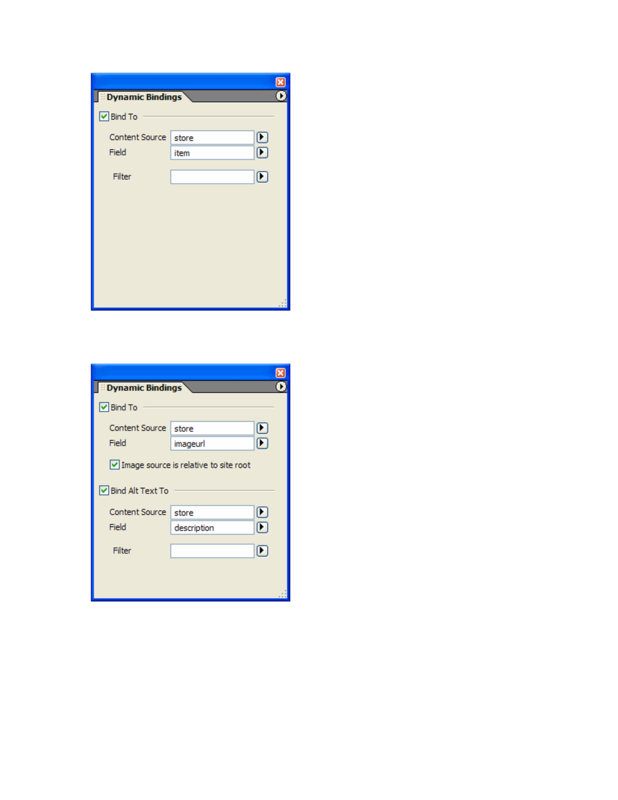 What you should see is a form box, several hidden field objects and one image box placeholder. The placeholder will pull an image from the PayPal site when you "golive". Now we're ready to add some dynamic content and descriptive text. 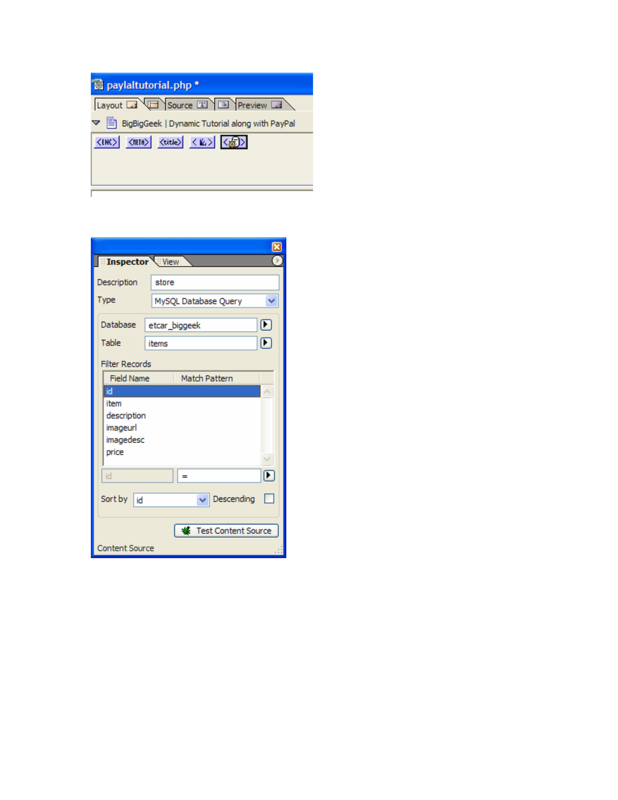 I've entered a label, Item and the place holder for the dynamic item text. To make the placeholder dynamic, highlight it. 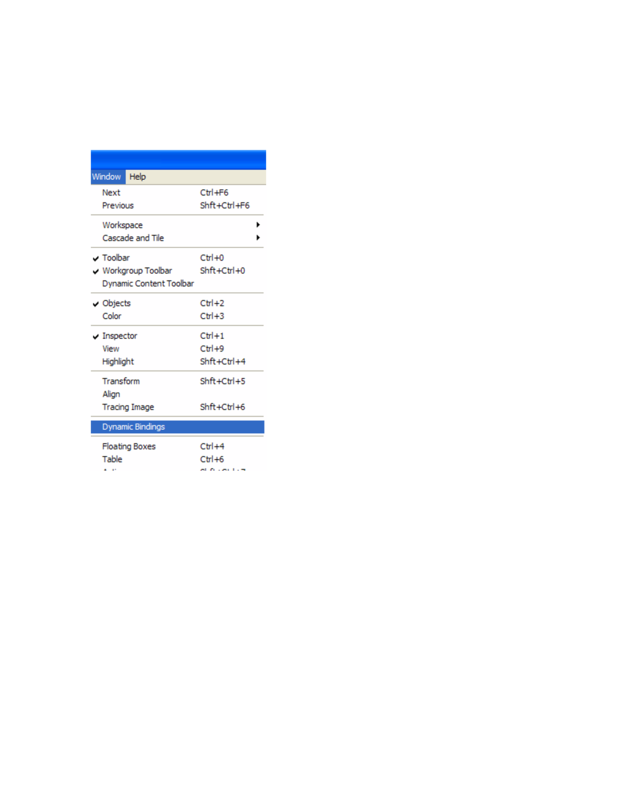 With it hilighted, select the Dynamic Bindings palette from the Window menu. From the Dynamic Bindings palette select your content source and field. Appropriately I've set the property to item. 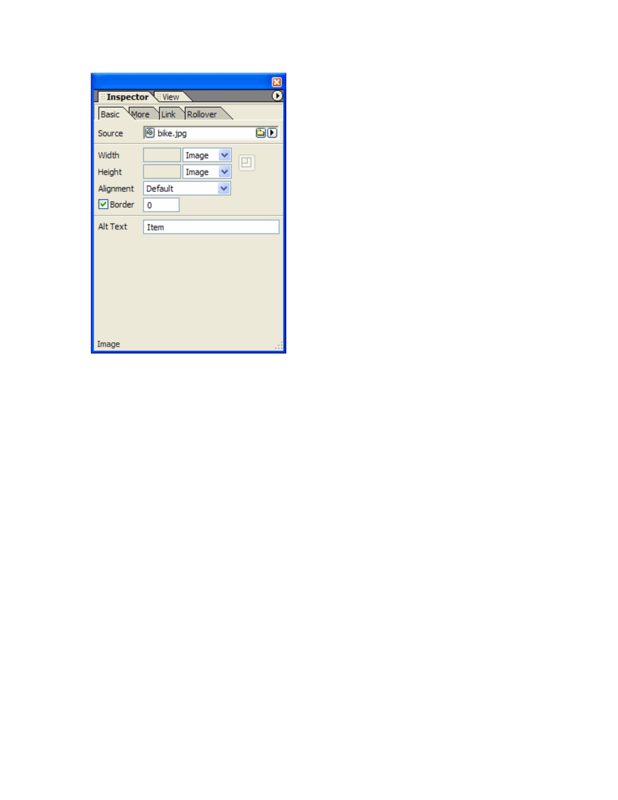 Next I'm going to add a dynamic image field just below the item and set its property to my image field and I'm going to set the alt text to match the description field. Make sure when using the dynamic image field to set the image width and height to the image settings to avoid distorting your pics. Last but not least I want to add some dynamic text for the price just as you did for the item text. Here is the page in layout view so far.